Qatar Airways frequently offers some of the most affordable flights even when they aren't running a sale! Their discount flights are very affordable. You can make them even more affordable by earning a flight discount voucher for a review. Here's the latest Qatar Airways flight special from South Africa. Note that flight specials sell out very quickly, and unless it's actually the morning of the special, it's likely to have sold out already. Qatar Airways operate international flights from Johannesburg, Cape Town and Durban to the rest of the to world via Doha. 4 April 2017: Save up to 20% on flights to Europe when you book before 9 April 2017 on Qatar's Europe sale. This includes flights from Johannesburg, Cape Town and Durban in both economy and business class. 16 March 2017: Head East with Qatar's latest special on flights to the Far East! Book before the 31st of May 2017 to save on flights until the 7th of December 2017. 12 May 2016: Save on international flights with Qatar this May. Book before the 18th of May 2016 to save on flights until the 9th of December 2016. Get all the details here. 17 November 2015: We are currently running a 25% off sale with Qatar Airways! Book before Friday, the 20th of November 2015 to save on over 50 international destinations! Travel from Cape Town and Johannesburg. Travel dates are from the 20th of November 2015 until the 30th of June 2016. *May have changed. The longer it is since the date the special was published, the greater the likelihood that it has changed. Subscribe to our travel newsletter (free) to be informed of the next Qatar Airways flight specials. These flight specials are no longer valid, the information is retained for historic reference purposes only. 08 June 2015: Qatar Airways is running a 25% off sale on flights to Europe and Asia. Book before the 15th of June and you could save up to 25% on your airfare. Flights start from R6282* Johannesburg to Amsterdam, R5990* Johannesburg to Athens, R5628 Johannesburg to Venice, R8375* Cape Town to London, R6595* Cape Town to Barcelona, R7611* Johannesburg to Bali, R5175* Johannesburg to Istanbul and R6668* Cape Town to Madrid. *subject to change, limited availability. 25 May 2015: Qatar Airways is currently running an up to 20% off sale! This includes amazing airfare deals like Johannesburg to Amsterdam from R6479*, Johannesburg to Phuket R6748*, Johannesburg to Berlin from R6323* and Johannesburg to Athens from R6152*. The sale ends on the 30th of May 2015 and the travel period is from now until the 10th of December 2015. 19 May 2015: Football Dreams Africa is playing FC Barcelona Under 15’s Youth Team in a friendly match on the 22nd of May 2015 in Barcelona. The airline is asking the public to design their own jersey for the African side. The 22 participants who are judged to have designed the best jerseys, will win one of these amazing prizes: 1 winner will receive two Business Class tickets to and Qatar Airways destination, 1 winner will receive 2 economy class tickets to any Qatar Airways destination, 10 people will win one FC Barcelona jersey each and 10 people will receive one FC Barcelona goody bag each. Click here for more information on how to entre. 13 April 2015: Qatar's ‘Fabulous Fares’ Sale brings you massive savings on both economy and business class seats from Cape Town and Johannesburg. Fly to London from Cape Town from either R7,709* in Economy class or R21,596* in Business Class. Fly to London from Johannesburg from either R7,283* in economy class or R22,262* in business class. The sale period for this sale is from today until the 19th of April 2015. Travel period is until the 10th of December 2015. *Limited availability, prices are subject to change. 16 April 2014: Qatar Airways UAE Special: JNB to Abu Dhabi from R5606*, JNB to Dubai from R5966*, JNB to Sharja from R5966, CPT to Dubai from R6256*, CPT to Abu Dhabi from R7906*. *Prices may change. 26 March 2014: Qatar Airways Special: Qatar Airways has launched flights to new destinations: Philadelphia, Miami, Dallas, Edinburgh and Larnaca. JNB to Dallas from R13152*, JNB to Miami from R12712*, JNB to Edinburgh from R8233*, JNB to Philadelphia fro R11682*, JNB to Larnaca from R7528*. *Prices may change. 3 March 2014: Qatar Airway's "4-Day Sale": Save up to 20% on flights that are booked by the 6th of March 2014. CPT to Athens from R6088*, CPT to Barcelona from R6398*, CPT to Istanbul from R5215*, JNB to Bangkok from R5949*, JNB to Larnaca from R6000*. Book via the Qatar Airways website. * Limited availability, additional terms and conditions apply. 10 February 2014: Book a flight via the Qatar Airways website, and you will stand a chance to win a Maldives holiday package for two. Bookings must be made between the 10th and 28th of February 2014, for travel dates up to the 31st of July 2014. Other terms and conditions apply. 20 January 2014: Qatar Airways "New Year, New Journeys Sale": Save up to 30% on Economy and Business class fares. CPT - Athens from R5,464*, CPT - Istanbul from R4795* JNB - Bangkok from R5571*, JNB - Barcelona from R5173*. *Prices are subject to change. This special offer is available until the 23rd of January. 2 January 2014: New Years special is running until the 6th Jan 2014, for travel until the 1st Jun. Cape Town to Houston from R9298*, Cape Town to Tokyo from R8595* & Johannesburg to Ho Chi Minh from R6137*. 25 November 2013: Save up to 20% on Economy and Business class flights to China. JNB - Beijing from R6921*, JNB- Guangzhou from R6927*, JNB - Hong Kong from R7,205*, CPT - Beijing from R7827*. * Terms and conditions apply, prices may change. This sale ends on the 14th of December 2013. 02 December 2013: Qatar Airways Bigger World Promotion: Save up to 25% on economy and business class flights*, this offer ends on the 5th of December 2013. Flights to Doha as a final destination are excluded, and stopovers are not permitted. *Prices may change. 11 November 2013: Qatar Airways Bigger World Promotion, save up to 25% on Economy and Business Class fares. JNB - Bangkok from R5,914*, JNB - Istanbul from R4,677*, JNB - Paris from R5,964*. This special ends on the 14th of November 2013. 21 October 2013: This is the most amazing Qatar Airways special that we have seen in a long time. Save up to 25% on Economy class flights from Cape Town and Johannesburg, book by the 24th of October. JNB - Bangkok from R5,870*, JNB - Chicago from R7,610*, JNB - Istanbul from R4,655*. 14 October 2013: Save up to 20% on Economy class flights from Cape Town and Johannesburg, book by the 18th of October. JNB - Bangkok from R6,311*, CPT - Singapore from R8,094*, JNB - Frankfurt from R6,360*. 20 September 2013: Up to the 13th October 2013 if you book Qatar Airways business class for flights up to the 18th December 2013, you can save up to 20%, + you stand a chance of winning one of 3 business class tickets, + if you're a Privilege Club member you get to earn double qmiles. 14 July 2013: Save up to 35% off Qatar Airways flights. 11 June 2013: Save 20% on business class flights from Cape Town or Johannesburg up to Friday, the 14th June 2013: To Athens from R20381*, to Bangkok from R22913*, to Barcelona from R23512*, to Dubai from R22970*, to Frankfurt from R24243*, to London from R26288*, to Paris from R24345*, to Singapore from R24339* or to Venice from R23470*. 13 May 2013: "5 star journeys to the far east": Cape Town to Bangkok from R7394*, Johannesburg to Bangkok from R7394*, Cape Town/Johannesburg to Beijing from R8168*, Cape town/Johannesburg to Bali from R9055*, Cape Town/Johannesburg to Hong Kong from R7664* and Cape Town/Johannesburg to Tokyo from R9661*. Seats are limited, maxi/min stays apply, not available on all dates, airfares may have changed from the above, cancellation & change fees appply, other T&Cs apply. 26 Apr 2013. Qatar Airways has the following flight specials from SA: Johannesburg to Istanbul from R5324*, Johannesburg to London from R7726*, Johannesburg to Madrid from R6340*, Johannesburg to Paris from R6840*, Johannesburg to Vienna from R6464*, Johannesburg to Zagreb from R6958*. 16 Mar 2013: Qatar Airways business & economy specials from Cape Town & Johannesburg to Athens, Barcelona, Dubai, Frankfurt, Hong Kong, London, New York, Paris, Perth & Rome. 11 Mar 2013: Qatar Airways Facebook special for South Africans to all destinations. 24 Oct 2012: Qatar Airways are offering 40% off in their business class when you bring a buddy along. For travel until 15 December 2012. Special ends on 30 September 2012. Terms & conditions apply. Applies for selected flights to India (except for Hyderabad), Gulf countries & Europe. 24 Sep 2012. 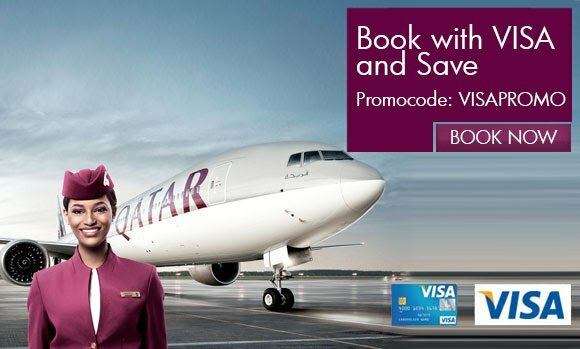 Save up to 20% on Qatar Airways business class fares booked before 24 September, for travel on selected flights before the 7th December 2012. 15 Nov 2011. Qatar Airways 25% off economy class tickets sale. 1 Jul 2011. Flight special with cheaper flights for kids to Dubai and other spots in the Middle-East. 11 Nov 2010. Qatar Airways special offers for November to Mumbai, London, Dubai and Delhi. 31 Oct 2010. Qatar Airways November specials from Cape Town & Johannesburg, business class & economy class. Special flight prices to Melbourne, Stockholm, Copenhagen, Seoul & Phuket. 18 Aug 2010. Qatar Airways fares from South Africa. 19 May 2010. Qatar Airways offers from Johannesburg and Cape Town. 17 Apr 2012. Qatar Airways Global Sale for 3 days - up to 25% flights.